My recent comments, made to Derby City Council’s Planning Committee, of an existential threat to the future of town and city centres, created something of a brouhaha in parts of the media. After 10 years of decline and associated retail closures – from Woolworths, through BHS, to House of Fraser – the view can hardly be a surprise. The post-war model of retail-led city centres – often described as the Great British High Street - is over, finished, kaput. Changing customer behaviour, rooted in a combination of the 2008 crash and the shift online, has effectively killed it. Which means that we are left with a simple choice – allow the decline to run its course and see where we end up, or take action to redefine the purpose and use of city centres. During the 1960s and 70s, the United States adopted the first approach. People and business moved out of downtown and the decline became so chronic that the centres of even large metropolises – such as Denver, Detroit or Los Angeles – became abandoned, no-go areas. Over the past 20 years the United States has seen a concerted attempt to turn this around and ‘rediscover’ downtown. The US is blessed with endless space to grow, but even there, they have figured it unhealthy to allow city centres to die. I know these cities pretty well and I see renaissance under way in all three. Denver is thriving, young, urbane and packed with universities and tech companies. Los Angeles is feeling like a city centre again, driven by city living, though wander into Skid Row and you see there is some way to go. And Detroit? 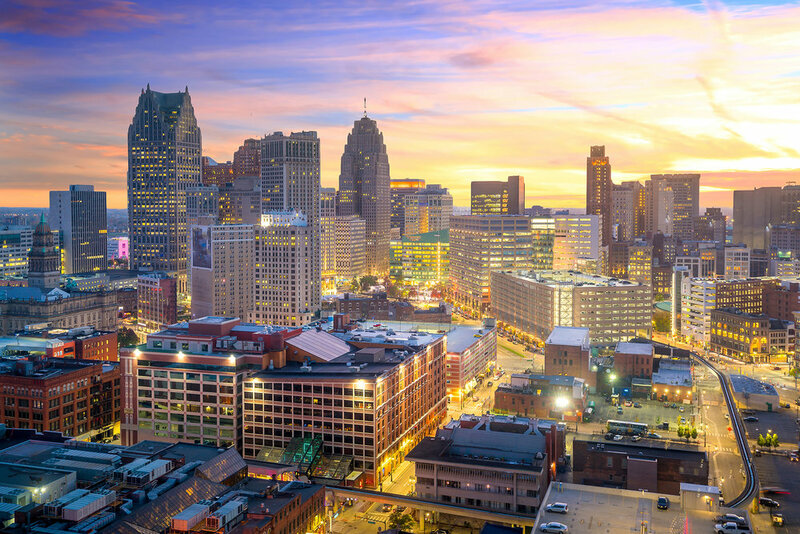 Well, Detroit fell a very long way, becoming a pariah city personifying decline and fall. But, even here, there are green shoots, driven by massive university investment and the Ford car company, relocating its HQ into an abandoned downtown rail station. The lesson is twofold: first, if you allow decline to run its full course, revival will take time and billions of pounds; second, the only way back is to mix it up and encourage new use in spaces that were previously predominantly retail. Derby is a long way from this nadir but we cannot deny footfall is down. Retail is struggling to keep its head above water and you never know where the next closure will be. Last week, Pattiserie Valerie; next week? Well first, I’m assuming two things, one, acceptance that we have a problem and second, that we want a vibrant city centre. I certainly do and so does Derby City Council, together with its wider business stakeholders via the Derby Renaissance Board, who have signed off this stated ambition in the city centre masterplan. The masterplan recognises that most people live in cities, that cities drive economies and their centres are a window to the world. We judge cities by their centres as when we visit any place we automatically gravitate towards the centre and from there we build our perception. The masterplan wants to create a vibrant city centre by making it a place to live, work and visit. Ah, as Shakespeare said, there is the rub – to live, work and visit. We have to do all three. Take the first of these, city living. Derby is running out of space. Planning applications are increasingly being submitted to extend suburbia – putting pressure on the edge of city and green fields. Many people would prefer to live centrally and city living is an essential ingredient in reimagining our centre. To achieve this, we need investors willing to build a residential offer very different from the suburban-semi with a garden. The good news is that we have been successful in attracting these investors and between student, office conversion and new-build, there are almost 5,000 resi- units under way, or in planning, for DE1. This will bring a population similar to that of Ashbourne or Matlock into the heart of the city. It will mean people coming into town each evening, returning from work, bringing energy, activity and money into struggling local businesses. Yes, city living is apartment living; yes, they are more likely to have terraces than gardens; and yes, the schemes may be taller than we are used to, but, if we desire a vibrant centre - city living is not a nice-to-have, it’s simply a must-have. The Planning Committee’s decision to approve – subject to conditions - Derby’s first upscale Build-to-Rent apartment scheme, the Landmark, was a welcome, positive and significant step forward. To achieve the second ingredient - working in the city centre - Derby has the added challenge that so much of our economic activity is located around the outer ring road - the ‘Derby donut’ as I call it. The 2005 masterplan had an ambition to create 1million square feet of new office space which, when built, would employ 10,000 people. Sometimes referred to as ‘suits on the street’ this desire was strangled by the 2008 crash. However, we cannot lose the ambition of having people work in the city centre. The City Council’s Connect scheme has successfully provided opportunities for numerous smaller companies – such as Marketing Derby – to come downtown. I’m delighted that the City Council is tackling market failure head-on by supporting two mid-sized office schemes in the Cathedral Quarter. Between them, Bold Lane and Full Street will bring another 800 workers into town and that can only be welcome. I believe private investors will quickly follow this lead. Finally, the third ingredient – visiting - still includes retail, which will need to evolve to survive but also leisure – the food and drink scene, arts and culture, performance and festivals. The reopening of the Assembly Rooms and Guildhall Theatre, the new Museum of Making, will all be positive for footfall but we still have to work on improving the customer journey, experience and broader offer. The city will soon be bidding into a £500m government pot aimed at revitalising city centres. The competition will be tough and to win, team Derby is going to have to create an exciting collaborative vision that delivers a tangible paradigm shift in how we realistically position Derby to meet the challenges and opportunities of the future.